I've always had a love affair with the tropics and its icons. I share it with many denizens of temperate climates who at times look for transport to a more benign climate - armchair travelers looking for a quick sojourn to the tropics, former citizens reminiscing or those who fantasize a vacation or perhaps a residence in an idyllic world of perpetual summer. On a cold night during a long winter, the sight and sounds of palm fronds rustling in a balmy wind warms my spirit. I feel like I have a radar operating subconsciously, scanning for all things tropical, whether real, such as plants or fruits, images in books or perhaps a magazine cover reporting on the latest roundup of best rated island destinations. So I was quite shocked to see this enormous banana plant thriving in Tompkins Square Park as I entered the western entrance to attend the Charlie Parker concert. I was certainly not completely alone in my interest in photographing this anomaly - whether others recognized it as such, I do not know. I asked one woman with a point and shoot camera whether she knew anything about banana trees, hoping to get some information regarding the ability of a tropical species to survive a temperate climate. She knew nothing of such matters and did appear to share my penchant for the tropics. So, I have spent the morning reading about banana plants. However, I can not report with any assuredness specifically what species of plant this is nor any history as to its planting. I did learn however, that there are non-fruiting ornamental varieties which can withstand winters - Musa Basjoo, Saja, and Ice Cream. The Basjoo can even withstand sub-zero temperatures. Any plant aficionados who want to jump in on this? 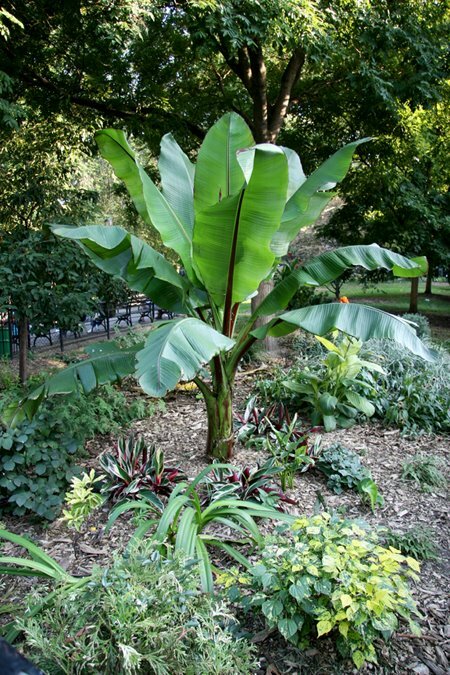 Note: The banana plant is actually not a tree but a herbaceous perennial. It is a giant herb of the genus Musa.